In the future, the majority of all vehicles will drive electrically. But should the energy come from batteries that are heavy, or a fuel cell that needs an equally heavy and solid tank for the hydrogen? It is unclear which system can finally prevail or whether there will even be a side by side — similar to the current gasoline and diesel fuel situation. China has decided — in the current five-year plan, the development of the fuel cell plays an important role. The government declares that it will invest in the necessary infrastructure by the year 2030 and that by then there will be 3,000 hydrogen filling stations. In Japan, Toyota is also focusing on the fuel cell as the engine of the future. Here, the necessary electricity for the production of hydrogen gas is to be delivered from coal power plants. These are equipped with modern CCS technology, which separates and stores the climate-damaging CO2 gas. Europe is changing course, relying on batteries and promoting development and production in the EU. The German government also supports the producers of battery cells with subsidies and tax benefits. Often these are companies from China that are building new production facilities in Germany, as there are already overcapacities for batteries in the Far East country. Most automotive manufacturers and suppliers do not want to commit to a technology yet. 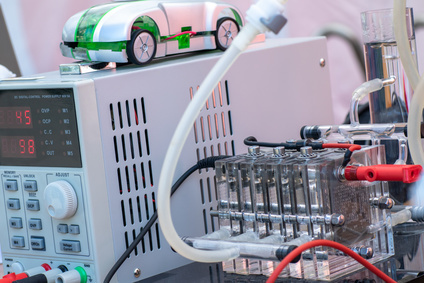 Bosch, for example, does not build batteries itself, but is researching the development of the fuel cell. In the US, the young company Nikola is developing a hydrogen-powered heavy-duty truck together with Bosch. Here, Nikola supplies the fuel cell technology while in the future truck a modular E-axis from Bosch is used, which includes the engine, the electronics and a gearbox. Daimler has with the Mercedes GLC F-Cell already a series production vehicle with a fuel cell in its portfolio and wants to build a network of 400 hydrogen filling stations in Germany with a joint venture H2 Mobility. Renault, since 2010 a cooperation partner of Daimler, however, relies on the battery technology. From 2025, newly developed solid-state batteries are to be used here, which are more powerful and cheaper than the conventional lithium-ion batteries. For example, the fuel cell for trucks and the battery for cars could prevail. The electric car start-up e.Go Mobile takes a different approach. It wants to use the fuel cell as a range extender. In this case, a battery is charged with a fuel cell, which in turn drives an electric motor. As a result, this system can be used in many vehicles. The joint venture e.Go Rex is to be founded this year together with Proton Motor Fuel Cell for production and development. Starting in 2019, e.Go Mobil will work with ZF Friedrichshafen to produce the e.Go Mover autonomous electric minibus and is also planning an electric compact car called e.Go Life. Do you want to export or produce your products to China? Do you need the China Compulsory Certification (CCC)? We can advise.